1. Preheat the oven to 180ºC, gas mark 4. Heat a saucepan over a medium heat and add the mince. Fry for 4–5 minutes, stirring to break up the meat, until browned. Pour in the tomato and garlic pasta sauce and bring to a simmer. Cook for 2–3 minutes, then set aside. 2. Cook the penne in a pan of boiling salted water for 10–12 minutes, until al dente. Drain well and set aside. 3. Meanwhile, in a separate saucepan, melt the butter and stir in the flour to make a smooth paste. Cook for 1 minute, then remove from the heat and gradually add the milk, stirring well to remove any lumps. Return to the heat and bring to the boil, stirring constantly. Simmer for 2 minutes, then season and set aside. 4. Spread half of the pasta in the bottom of a deep, 2-litre baking dish. Spoon over the meat sauce, then top with the remaining pasta. Mix the egg into the white sauce and pour over the pasta. Sprinkle over the cheese and bake for 25 –30 minutes. Serve with a crisp green salad. 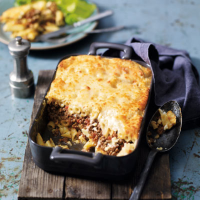 Spice up this simple Greek-style pasta bake by adding a little ground cinnamon or some dried chilli flakes to the meat sauce.